When vacationing in Baltimore plan to spend a day in Washington DC, only about an hour drive away. America’s capital is a beautiful city filled with significant sites. Iconic touchstones of democracy, amazing museums exhibiting the nation’s treasures, moving monuments and memorials and statue-filled parks tell America’s story. With so much to see, plan ahead to get a good overview and have time to tour one or two of sites in depth. What you choose depends on whether you are traveling adults or families with children. Start out early and stay late. If you plan to drive, get there via I-95 or scenic MD-295, the Baltimore/Washington Parkway. Hit the road early and plan to have breakfast on the way. If you’re traveling with kids or like a hungry man breakfast, stop at familiar chain restaurants near highway exits. If you’re traveling without kids, take a short detour west on MD-32 towards Columbia to tiny Renata’s Bakery on Snowdown River Parkway. Renata’s opens at 8 am everyday but Monday, ready to serve freshly-baked quiches, tasty tarts and scrumptious scones. You’ll see Maryland off the main roads, miss the height of rush-hour traffic and get to DC in time to spend a full day. 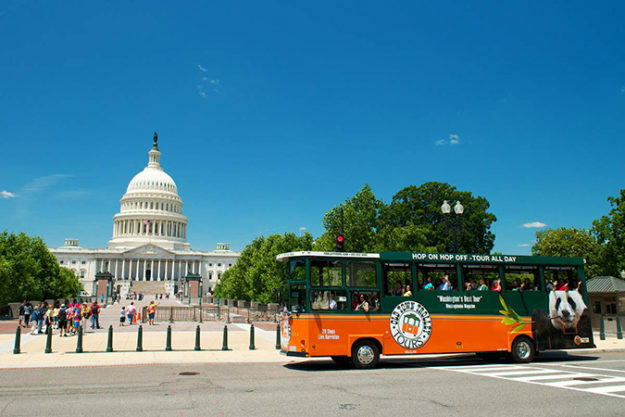 Once in DC, the ideal way to see the most in one day is to park the car and start the day with a hop on/hop off Old Town Trolley Tour. 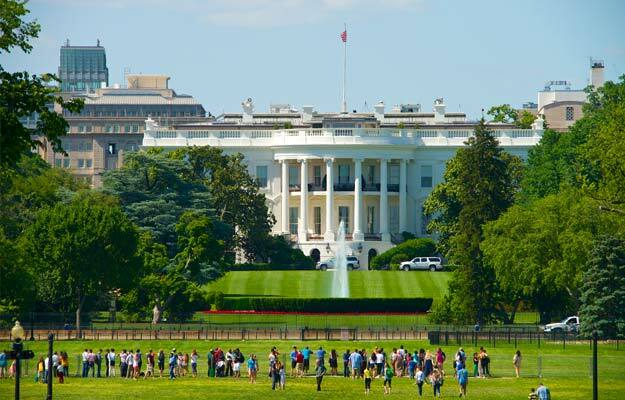 On the interesting tour, see everything from big viewing windows and enjoy an entertaining narrated overview of the nation’s capital as it you pass by all the places you came to see – Smithsonian museums, the U.S. Capitol, the White House, and iconic monuments and memorials. Hop off at any of the 25 stops to check out the special places a short walk away. Take the time to check out what’s around each stop and plan where you want to hop off to see those special places up close. If exploring America’s great museums is on your must-do list, pick out two that appeal to your interests. To fully appreciate them takes time. Tours. Sightseeing on a Segway Tour is a blast for travelers with teenagers over 16 and young adults. There is something totally cool about gliding around the National Mall in plain sight of the U.S. Capitol and impressive Washington Monument anchoring each end, along Pennsylvania Avenue, by the White House and to interesting off-the-Mall spots. Museums. Allow a minimum of 2-3 hours for each selection. 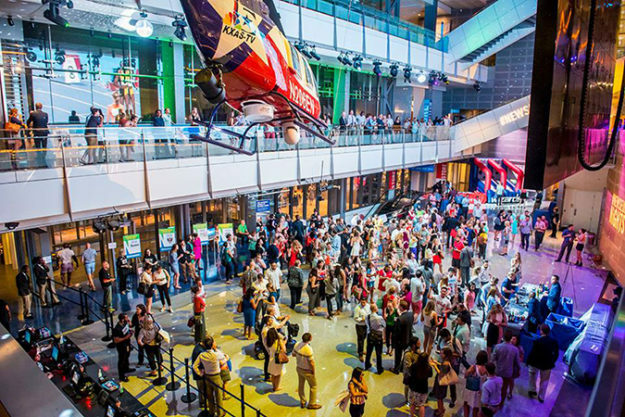 Of the free, amazing Smithsonian Museums, the lure of space travel, the solar system, and the universe makes the Air & Space Museum a perennial favorite. Hundreds of aircraft, spacecraft, missiles, rockets and flight-related artifacts, all the real thing, fill the awesome massive space. Inside the massive American Natural History Museum, everything from the largest mammal to the smallest insect is exhibited. With an emphasis on human origins and the development of cultures, exhibitions of ancient and modern mammals, birds, amphibians, reptiles, insects and sea creatures, rocks, gems, fossils and dinosaurs fascinate children and engage adults. The Newseum is dynamic and interactive. On seven levels, multiple theaters and galleries packed with exhibits explore journalism through the lens of the five freedoms of the First Amendment: religion, speech, press, assembly and petition. Inside the International Spy Museum, kids jump right into the shadowy world of international espionage by adopting covers and breaking codes. The large collection of international espionage artifacts on exhibit is attention-grabbing; delving into the stories of real spymasters is fascinating. The Air and Space Museum is always a favorite. The National American History Museum is a fascinating journey through American life and ingenuity. It’s fun to explore the everyday and the extraordinary of the country’s cultural, social, technological and political experience. Serious history buffs should visit the National Archives. Step into the huge Rotunda to see the original U.S. Constitution, the Declaration of Independence and the Bill of Rights. Walk through the evolution of American democracy through fascinating displays of original documents and records in the Public Vaults. The Holocaust Museum is an intense insight into the harrowing experiences of millions of Jews and others targeted by Nazi tyranny during World War II. Tragic events and experiences of individuals and entire families are recounted on a personal level through pictures, videos and reproductions. The realization of what happened and the events allowing it to happen are a sobering reality check for every visitor. See one of the world’s finest collections of modern and contemporary art in the Hirshhorn Museum and Sculpture Garden. In the National Gallery of Art, the West Building has one of the world’s best collections of painting and sculpture from the 13th to the 19th century, including the only da Vinci painting in the Americas. The East Building has an impressive collection of modern and contemporary art. In the American Art Museum, see three centuries of the work of American artists – from folk to contemporary art. Walk across the courtyard to the National Portrait Gallery to view a remarkable range of portraits of influential Americans from the 1600s through the 20th century. A tour of Arlington National Cemetery is a serenely beautiful experience. If you are on the Old Town Trolley Tour, hop off at stop 10 to be transported onto the grounds to board tour vehicles which take visitors through the final resting place of more than 400,000 active duty service members, veterans, and their families. Stops along the 45 minute tour include the John Fitzgerald Kennedy Gravesite and the Tomb of the Unknown Soldier. 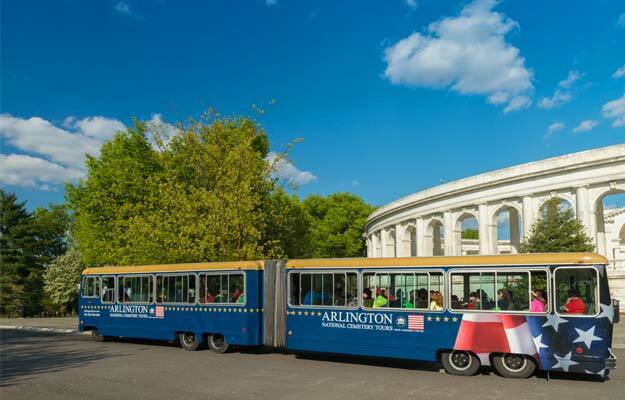 If you are not on the Old Trolley Tour, which includes the Arlington National Cemetery tour in its ticket price, individual Arlington National Cemetery tickets can be purchased. Washington DC’s grand monuments and memorials are iconic touchstones. They honor the valor of soldiers, as well as Presidents Jefferson, Lincoln and Franklin Delano Roosevelt, and civil rights leader Martin Luther King, Jr. While you can walk through them during the day, seeing them at night glowing in white light is awesome. For that unique experience, plan to stay late to end your day in DC on the 2.5 hour Monument by Moonlight Tour. Departing at 7:30pm from Union Station, the tour offers fabulous nighttime views and up-close looks at amazing details at 3 stops – MLK Jr. Memorial and FDR Memorial; the Lincoln Memorial and the Vietnam Veterans Memorial and Korean War Memorial nearby; and the dramatic Iwo Jima Memorial.